July 16, 2018: The Grande Maison cultivates strong ties with the film industry and displays a commitment to highlighting filmmaking culture. 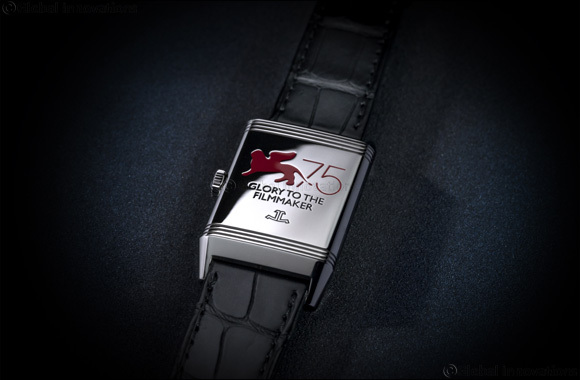 During the 75th International Film Festival of La Biennale di Venezia, Jaeger-LeCoultre will celebrate the 13th anniversary of its partnership with the momentous event, and support talents through unique initiatives and cinematic moments. For thirteen years, Jaeger-LeCoultre has been supporting all those who daily contribute to create and bring life to the art of filmmaking, and attaching great importance to the preservation of its heritage. In this spirit, Jaeger-LeCoultre pays tribute to filmmakers’ creative ingenuity by conferring the Glory to the Filmmaker Award on a personality “who has brought great innovation to contemporary cinema” (Alberto Barbera). The list of past honourees makes fascinating reading: Takeshi Kitano (2007) Abbas Kiarostami (2008), Agn�s Varda (2008), Sylvester Stallone (2009), Mani Ratnam (2010), Al Pacino (2011), Spike Lee (2012), Ettore Scola (2013), James Franco (2014), Brian de Palma (2015), Amir Naderi (2016), and Stephen Frears in 2017. As a loyal sponsor of the International Venice Film Festival, Jaeger-LeCoultre will be actively involved in all the highlights of the event, adorning the stars with its finest creations and presenting a personalized Reverso watch to the winners of the Best Film (Leone d’Oro, the Golden Lion Award), the Best Actress and Best Actor of the year (Coppa Volpi Awards). The watches will feature a lacquered engraving depicting a lion, the symbol of Venice, handcrafted in accordance with the finest traditions, and bear the inscription “75. Mostra”. Jaeger-LeCoultre has remained dedicated to the legacy of watchmaking traditions while maintaining its expertise for invention in creating authentic, fine watchmaking legends. Committed to a constant quest for excellence and driven by a unique inventive spirit, Jaeger-LeCoultre has a long-standing engagement in supporting the appreciation and preservation of film.